An ancient principality of Germany, now a state of the German empire; formerly divided into four duchies: Anhalt-Bernburg, Anhalt-Dessau, Anhalt-Köthen, and Anhalt-Zerbst. Its former capital was Zerbst, a town on a tributary of the Elbe, situated about ten miles northwest of Dessau. Jews are known to have been permitted to live here before the year 1440, and it is said that the "Jüdenstrasse" (Jews' Street) dates from the fifteenth century. According to an agreement made in 1460 and a document drawn up in 1488, the revenue derived from the Jews was to be divided between the prince of Anhalt and the town of Zerbst. The Jews owned no real estate there, and seem to have lived in the town at irregular intervals, and then only in small numbers. In 1774 several families from Dessau settled at Zerbst. But the settlement of Jews in other towns of the duchy is even more recent than this. At Bernburg, also the capital of the duchy of Anhalt with which its name is linked, a city situated on the Saale, there was a synagogue in 1454; and here, in 1462, Bernhard VI., prince of Bernburg, sold to Tile Goldschmidt a house near the "Joddenschulen." In Dessau, the capital of the duchy of Anhalt-Dessau, a city about eighty miles southwest of Berlin, a small number of Jews lived in 1621. Here Prince George II. permitted them to build a synagogue, and he gave them the use of a cemetery as well as a piece of land for a hospital (heḳdesh). In the villages of Anhalt-Dessau the Jews lived in large numbers. In 1764 Prince Leopold granted the Jews a constitution and issued regulations for the maintenance of their credit. He abolished the poll-tax in 1804, and permitted the Jews of Woerlitz to build a synagogue. In the same year Leopold recognized the Franzschule as a Jewish public school. Important Hebrew printing-houses existed at Köthen from 1622 to 1717, and at Jessnitz from 1719 to 1726. 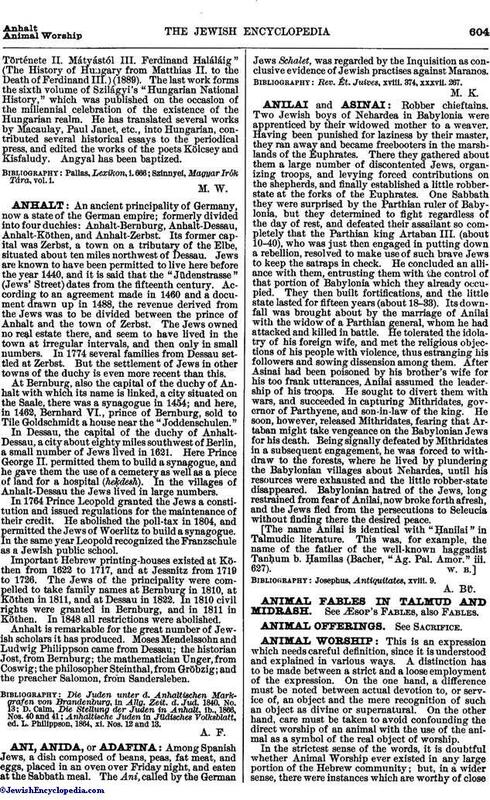 The Jews of the principality were compelled to take family names at Bernburg in 1810, at Köthen in 1811, and at Dessau in 1822. In 1810 civil rights were granted in Bernburg, and in 1811 in Köthen. In 1848 all restrictions were abolished. Anhalt is remarkable for the great number of Jewish scholars it has produced. Moses Mendelssohn and Ludwig Philippson came from Dessau; the historian Jost, from Bernburg; the mathematician Unger, from Coswig; the philosopher Steinthal, from Gröbzig; and the preacher Salomon, from Sandersleben. Anhaltische Juden in Jüdisches Volksblatt, ed. L. Philippson, 1864, xi. Nos. 12 and 13.